Sushil Thapa is a renowned artist of Nepal, specializing in recording contemporary Nepal’s ethnic diversity through his works. Interested in painting from a young age, he is self-taught and art is his passion. He creates paintings in oil and acrylic, although pen and ink is his forte. His main subjects are the people of his country from different ethnic backgrounds (below left ‘Tharu Woman’ and Waiting (Lama)’. The artist was attached to the Centre for Victims of Torture (CVICT), Kathmandu for thirteen years, and through his art works supported various Human Rights campaigns. 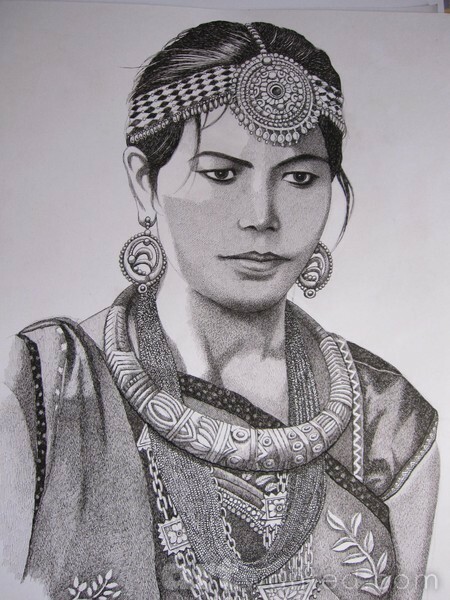 At that time he contributed to several journal articles with his illustrations, and met in prisons a number of victims of torture, including women, and teaching art techniques for both generating income for these victims and to enhance their psychological well-being through this creative activity. 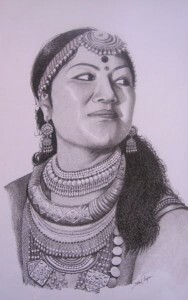 Sushil is now a freelance artist. He has taken part in many exhibitions including at Bangkok (Thailand) and Palais des Nations (Office of the United Nations- High Commissioner for Human Rights), Geneva. 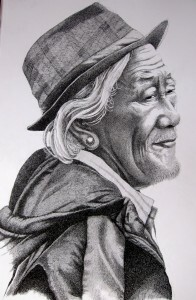 His art works are featured on the website www.artwanted.com/sushilthapa. Sushil is a supporter of the NIAP from the earliest stages of its development in the autumn of 2013, because the programme highlights both of his passions; exposure to the English-speaking world of the diversity of Nepal’s ethnic cultural heritages, and core humanitarian and social justice/empowerment values. Mr. Sushil Thapa picks up his subject from day to day life and feelings of human beings. Although he uses oil, acrylic colours as his mediums, pen and ink always remain his favourite. 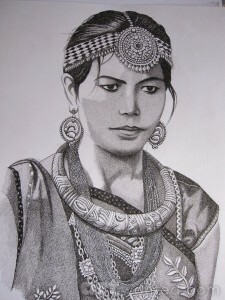 After coming in contact with T.Muni, a well-known company which were pioneers in rice paper printing in Kathmandu(1980s)., He started drawing Hindu gods , goddesses, various incarnations and mandalas of Lord Buddha in traditional style which were later printed on greeting cards, calendars, lamp shades made of rice-paper. Under the personal guidance of famous traditional artist the late Trantrik Muni, he mastered handling quills and other technical pens and his strokes gained fluidity accordingly. In 1992 he joined a Human Rights organisation called ” Center for Victims of Torture, Nepal”. This organisation then commissioned him to decorate with his illustrations on several of their publications mostly based on the reports of Fact Finding Missions. It was the time when I supported campaigns like people’s voice against torture, organised violence, human trafficking, disappearance, child labour, domestic violence and corporal punishment in schools through his various artworks. Eventually this helped him gain recognition within Nepal and abroad. A painting entitled ‘ Hope’ printed and published on the cover of a video” From terror to Healing” Part-1( winner of 2001 Telly Award) produced by the Center for Victims of Torture(CVT), Minneapolis, USA. Another painting Entitled ‘ Peace’ was printed on the cover of a video ” From Terror to Healing, part II( winner of 2001 Videographer Award of Distinction) produced by the Center for Victims of Torture(CVT). Illustrated ‘Combating Torture and ill-treatment’ published in 2001 by International committee of Red Cross( ICRC), Geneva. Drawings printed by a quarterly Journal PST- April- December 1997 by the Psychosocial Trauma and Human Rights Program, Philippines. Illustrations printed by ‘ The Lancet’ of USA, Vol, 358 in 1st Sept, 2001. Illustrations printed on the cover page of a medical group Newsletter, Amnesty International, British section, Autumn 1992. A calendar produced by Nepal Pharmaceuticals Laboratory Pvt Ltd printed Mr. Thapa’s drawings on the people from different ethnic groups in 2005. Another calendar produced by Sunrise Bank Limited printed his 12 drawings on the characters belong to various communities in 2009. Designed and illustrated , a comic book based on ‘True stories of Women Survivors of Armed Conflict,’ printed and published by SAATHI/ UNFPA( United Nations Population fund) in 2007. Illustrations printed and published in a book of poems by a well -known Indian poetess Elizabeth Kurian ‘ Mona’ . Al those sketches are done by following each and every theme of her poems accordingly. 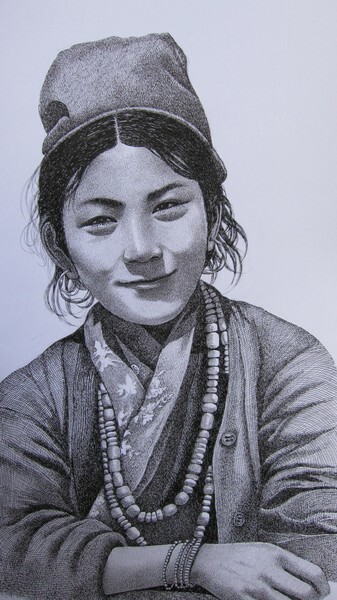 Currently Sushil is working as an illustrator for school-children’s textbooks in Nepal.